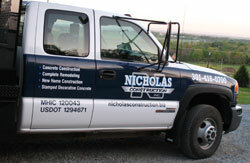 We specialize in Concrete and General Construction, New and Remodeling, complete from excavating to trim. We can take care of all of your needs in basement and garage floors, slabs, walks, driveways, custom patios, pool decks, stamped decorative concrete and masonry foundation. In general construction, our projects also include additions, new homes, finished basements garages, decks, and complete remodeling.